Ever have one of those days?Winds nice, sun is shining and temps just right. Ya think boy oh boy this is gonna be good.Up ya go and blah.Timing is just sucky. Fly a bit and hey axles are good. 1/2 axles are coming okay.Maybe it'll just take a bit and the groove will come. Try a little bit but nothing much is clicking. Then ya lightly hit the ground in a position that you've hit a hundred times before with no ill effect.Horror upon horror the kite seems to disintegrate right before your very eyes. Dejected ya plod towards the workbench mumbling about how bad the day has turned.Put the poor mangled thing on the bench and bang , viola, epiphany. If fixed differently then the last 5 times it'll be better than new.Joy ensues with lots of smiles until you realize it's going to take FREAKING FOREVER for the needed stuff to arrive.Relearned lesson of the day? Better to feel impatient than dejected. Poor Hydra 😧. Love that kite and it's owed a good refurbish. 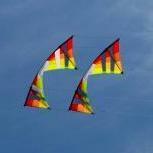 That's a reason for having many different kites with overlapping capabilities. Fly while the wind is good, fix any damage later. Yup but some days ya keep going ya keep adding to the fix it pile LOL.